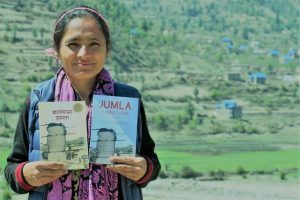 The word is Miteri is very indigenous concept and practice in Nepal that prevailed in community for about 250 years before. It is mutual love and respect beyond marriage and blood regardless of caste, class, gender, religion and so on. In Mahabharat, the the mutual friendship and respect was mentioned as a form of Miteri between Sudhama and Krishna. In Nepali community, it is practicing in many ways. Primarily, it is tool for cultivating culture of peace and peace building, inclusion, social harmony, cohesion. It simply abolish the hierarchy, creates safe space for individuals from any strata of the society with dignity. It has been using for many positive reasons and rarely used for opportunities too. It has many meanings in Nepali context like social enterprise, economic empowerment. The political empowerment only sustained if there is association of economical empowerment. By following the footprints of Nobel Laureate Prof. M. Yunus, RPF tried to replicate the seven principles of social business to break the stereotyped NGO work in Nepal. RPF strongly beliefs that the working in innovative manner is not easy in many ways. As long as possible, RPF like to demonstrate the role model around the cause it beliefs and create the movement started from personal or local to national and finally at global level. Because there is direct and indirect connection with global and national politics behind the discrimination or inequality among the humans in this universe. Holding accountability is the most challenging task always though RPF passionately behaving like this. Because the reason behind the failing in development specially in women’s right discourse is because of lack in accountability. Corruption and silence is huge cloud among Nepalese folks as well as beyond. RPF purely like to represent the independent civil society organizations as voice of voiceless and stands/speaks whenever and whatever required by crossing the comfort zones. Because each human beings deserved dignity in this universe. RPF has practiced democratic approach though the organization and team members are still growing up. RPF has two management approach; strategic and operational. Under the strategic management approach, the entire team meet in quarterly basis (more if needed) and review and reflection of the organizational activities and conclude with way forward. Team, developed plans for program, funds and all. There is provision of annual assembly too. 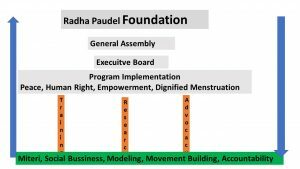 Here, the role of director (Ms. Radha Paudel) is to provide input as coach or mentor to team members for effective planning, and execution with quality. Because building leadership within organization is also very important for sustainability. Under the operational management approach, team members execute the planned activities as agreed meetings. Often, the coaching is ongoing through phone calls, emails and meeting at person. The needs or gaps are identifying based on experience of team members as well as included the voice of target groups and designed. RPF is very straight forward to say no if there is situation of compromising the principles of the organization. In addition, RPF does comply the procedures with government at local, provincial and central level. It has mechanism to do internal and external audit and also regular reporting as organizational, governmental and donor policy as agreed.